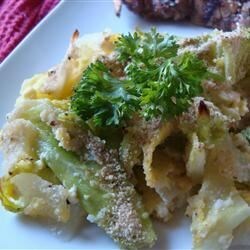 "This is a cabbage casserole that is just delicious. Great in place of a starch at a meal. Also good with ham, pork or any barbecued meat." Preheat oven to 350 degrees F (175 degrees C). Grease a 9x12 inch casserole dish. Melt 1 tablespoon of butter in a large pot over medium heat. Add cabbage and onion and cook for about 20 minutes, or until tender, stirring often. Add milk and bring to a boil. Reduce heat to low and simmer for 5 minutes. Gently pour in eggs, stirring constantly. Stir in 3/4 of the cracker crumbs, and the salt and pepper; mix well. Pour into casserole dish and top with remaining cracker crumbs. Dot with butter. Bake in preheated oven for 30 minutes, or until golden brown and heated through. Perfectly creamy scalloped potatoes, just like Mom would make. Made this last evening as someone had given me a head of cabbage. If I make it again I will add shredded cheese. Very good. I used italian breadcrumbs in place of saltines. It was good but next time I will add cheese also. This was a nice twist to a new way to make cabbage...We did enjoy it very much..I did add more salt and pepper.. I love cabbage, so this hit the spot for me. Needed a lot of salt and pepper. Will definitely make again!